In the United States alone, disengagement costs $550 billion dollars annually. Before you can solve the problem of disengagement, it’s important to understand it and learn how to recognize it. 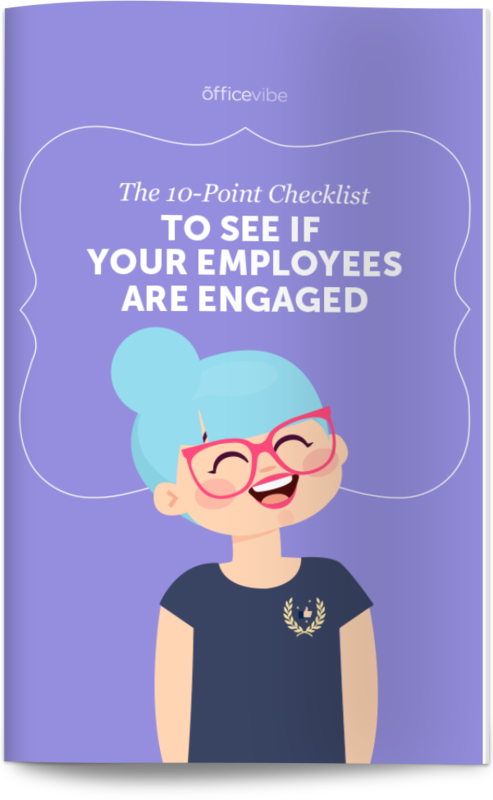 Download the complete checklist of the 10 most important things you need to do to keep your employees engaged. <a href=”https://www.officevibe.com/state-employee-engagement”><img src=” https://assets.officevibe.com/infographics/infographic-engaged-vs-disengaged.png” alt=”Engaged Vs. Disengaged Employees” width=”600px” border=”0″ data-no-lazy=”1″ /></a>This infographic was crafted with love by Officevibe, the engagement software that shows you <a href=”https://www.officevibe.com/employee-engagement-solution/leadership”>how to be a good leader</a> for your employees. When a student acts out in school, it’s usually a symptom of a problem, like issues at home. No matter how many times the student gets sent to the corner, the problem won’t be fixed because his behavior isn’t the issue, it’s a reaction to something. The same goes for the behaviours at work. Disengagement is a symptom of a larger problem, and it’s your job as a manager to get to the root of it. Disengaged employees might skim their workload and hand in a half-baked final product. Engaged employees, on the other hand, show initiative, enjoy their work and are eager to take on new projects. Do they have a general drive to bring more to the team than what is asked of them, or are they working just to earn a paycheck, not develop a career? How you can fix it: Make sure to communicate constantly and give proper recognition and meaningful feedback. No one has the internal stamina to continuously pump out epic work without a pat on the back once in a while. We’re human. It’s really important to learn whether or not your employees would recommend their company as a place to work. The Employee Net Promoter Score is the best way to measure this. A low eNPS means you likely have disengaged employees. Employees who score 9 or 10 are called ‘Promoters’? Those who score 7 or 8 are ‘Passives’? An employee who gives a score of 6 or below is a ‘Detractor’? Generally speaking, we like to improve upon and participate in things that we care about and that are meaningful to us. So, either your employees aren’t connecting with the mission and values of the company, or they aren’t happy in the office environment. Added benefits like these are important in making the overall employee experience a positive one. But, as the wise Beatles once sang, “Can’t buy me love”. Without a foundation of respect, alignment, and great communication, those perks are just fancy bandaids. It isn’t always easy for employees to speak to their managers. I was so scared of a former manager, I would pretend to be on a call if I saw them walking in my direction (oh the shame). She never said hello, thank you, or even smiled. All I heard was the heavy tap of her heels and it was enough to make me scurry onto a fake phone call. The problem with bad managers like this is that it infuses fear in your employee’s workday. Say good morning, smile, be positive, check in on work, and offer feedback often. Be part of the team, not above it, and create a safe environment based on mutual respect, trust and appreciation. Work shouldn’t be a scary place for anyone, and it all starts with the tone that’s set. Every morning at Officevibe, our CEO gives each member of the team props. It’s a quick way to say “hey, I see you, thanks for being here and getting good work done”. Think about it, when we have an ailment, like a headache, we complain that our head hurts. The same goes for employees who complain. It’s not for no reason…there’s something about work that’s bothering them or causing them to be unhappy. Are your employees working overtime often? Are you emailing them on the weekend? Are you forgetting to give praise? Do you often cancel or forget to book feedback sessions? Audit the situation and see if there’s something you need to improve on your end. A disengaged employee finds it difficult to concentrate on their work so they might fill their time doing other things like going to the bathroom, making a ☕️, having a snack, checking social media or staring at the clock. Why does this happen? It could be because they’re overwhelmed with their workload, or worse, unmotivated by it. It’s a simple enough question, but does your employee enjoy their tasks and connect with their job? Make sure they are not under-challenged and have enough work to stimulate them. Have an open conversation in a one-on-one about their role within the company and how they see themselves ideally contributing. Transparency is key, so help start the conversation and see what needs to be fixed. You can often tell how engaged employees are by the quality of their work. An employee who feels comfortable handing in a sloppy final draft doesn’t care about the personal consequences or the success of the company at large. If “good enough” becomes part of the vocabulary, there is a problem, but you have to ask why it’s happening? Are your employees bogged down with work and need to rush to meet deadlines, or have you been neglecting them? If you don’t water a plant, it won’t grow. How you can fix it: No matter how busy you get, remember to show employees respect and appreciation. Offer meaningful recognition, and they’ll reciprocate the respect by producing quality work. Positive reinforcement for a job well done is not a new concept, but it’s a solid one. Looking for another job means they already have one foot out the door. Employee turnover is not only straining for a team and its workflow, but it costs a lot of money, so it’s important to work on the problem before it even exists, and that means starting with a great and successful onboarding. 35% of employees say that they have to wait three months to get feedback. And at that point, it might be too late. At a previous job, I had asked several times for my 3-month evaluation, yet I only received it after 9 months. I felt exceptionally insignificant and, the quality of the feedback I got at that point was weak and irrelevant. Making your employees feel like an afterthought that early in the game is setting them up to leave. Be true to your word – If you said monthly one-on-ones, have them. Employees look forward to it. Have an open-door policy so employees know that they can talk to you, and actually leave your door open. Think beyond the now – Offer your employees professional development programs so they feel secure that you are invested in their future with the company. Without this constant, open dialogue, you will become blindsided by their decision to leave and your team will be left with a hole, which are not always easy to properly fill. In this article, Forbes gives some really helpful tips on how to tell if your employees are on the job hunt. Everyone makes mistakes. It’s human nature. And it’s ok, even at work. Mistakes are a valuable resource. An engaged employee accepts mistakes as part in parcel with the job, owning up to them so they can do better next time. It’s not always easy to fess up and admit failure, but someone who is invested in the company ultimately wants to learn and improve. Disengaged employees will make excuses, or blame other team members instead of taking responsibility. Remove fear by letting your employees know that honest mistakes are welcomed and that everyone is here to learn. Incorporate that mindset into your business model and the culture of the company. Commend employees on how they attempt to correct their mistakes, instead of reprimanding them. Remove shame by not hiding mistakes from the rest of the team. Point out what the team can learn from the trial and error – keep the workplace positive! Every team has some quiet members who prefer to work independently, and this is totally ok. Introverts can be highly engaged and bring a lot to the team. They simply have a different way of working. But not lending support to coworkers or wanting to participate group initiatives is another story. According to our data collected from The State Of Employee Engagement around the world, 37% of employees don’t feel they have enough interaction with colleagues at work. As a manager, it’s your job to encourage collaboration and fraternization between the team. Schedule group lunches once a week to catch up and have a laugh. Organize after-work gatherings in a more social setting. Have Monday morning team meet-ups to recount your weekends and set goals – start the week off with connection and conversation. Basically, inspire constant communication and create fun opportunities for the team to interact. Jobs extend beyond the desk and chair! How do you keep your team engaged? We’d love to hear some of your pro tips.